Well, for any of you who have read this blog in the past, you know that I haven’t written anything new in several months. I have made attempts, but was unable to complete any because I was too busy time traveling. Now I know you might be thinking this is no excuse. I mean after all, if I have the power to time travel, why don’t I just go in the past and write some blogs and then I won’t have to explain why I never wrote them. True, I could do that. But the present that now exists is based on the fact that I didn’t write the blogs in the past because I was time traveling in the present of that past. If I go back in time and write them then I will return to a new future that I cannot recognize based on me being present in the past writing blogs about God knows what. If you are a reader of my blogs that means your whole life will change too. Are you ready for that? If I wrote those blogs and you read them, they would have influenced you to a different degree than the absence of them did. Even if you didn’t like the content, you’d be sitting there reading them thus throwing off how you spent your time in the past resulting in you arriving in a different future. That future of the past when you read those blogs would replace your current present and you wouldn’t even know it. So rather than change the lives of others because I want to change my past, I will write this blog in the present to explain why I didn’t write them in the past. Hopefully the knowledge I brought back from my time travels will inform your present and influence you to stay present Now and into the future. God is always in the Present: If you accept nothing, accept this. While time traveling my sense of reality kept getting distorted every time I arrived in the past or the future. While there, I felt disengaged from all other people, places, and things. I had this secret and couldn’t talk to anyone about it. So, I prayed a lot. I would always talk to God before I said anything to others. This was so beneficial to my relationship with God. That’s when I realized that God is truly always Present. No matter when or where I am I can always talk to God now. God is Ever-Present–meaning always Now. No need for costly and complicated time travel. I time traveled in my effort to undersand why other people made their decisions and to look for guarantees in the future, but ended up even more disconnected unless I put God first, which I can always do Now. It’s Addicting: Once you start time traveling, you get the false sense that if you can just find the right moment to justify the past or create hope for the future then your present will be perfect or at least make sense. It won’t happen. What happens is when you return to the present you will always find that there is something else that could use a little tweeking. It never stops. Not only that, while you are in the past or the future trying to fix the present, you miss the the actual present and whatever joy it can offer. This makes you feel down and consequently you jump back in your time machine to try to go back to what you missed only to keep the cycle going. 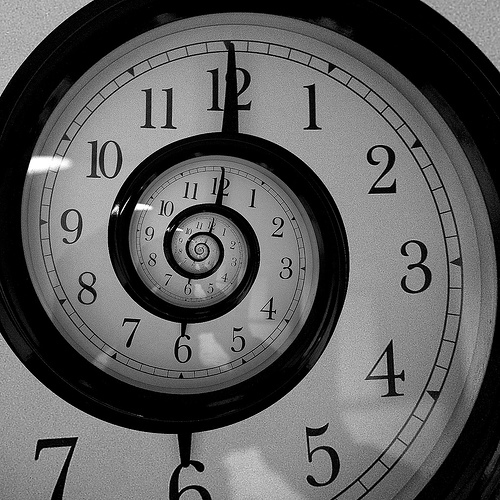 Our perception of time is a selfish illusion: With few exceptions, most time travelers are only looking at their version of the past and their self centered intentions for the future. They do not consider that they are just one person out of billions and billions that we are all interconnected with across time and space. If you go to the past or future to change anyone else for your own benefit then you are motivated by an illusion. We don’t know how that time has served others. As Paul put it, “We see in a mirror darkly.” So unless you time travel solely for the benefit of others, there really isn’t much point to it. You might end up not existing: If you time travel too much, you never really get to be in your true God-given Present. Even when you’re physically present, you will probably be so in the habit of planning your next trip that you won’t even be paying attention to all of the wonderful things going on around you. You’ll be too busy trying to figure out how you can change things that no one will even get to know the real you. You’ll be too space-timed out. It will be like you’re not even there and you won’t be when it counts. You might get everything you wished for: Just think how lonely and boring it would be if you could make everything exactly the way you want it, but without the ability to share it with others. Not to mention the guilt you would eventually feel from knowing that at every turn, you would be going around manipulating people and situations to shape them to your temporary desires. Get that? ALL EARTHLY DESIRES ARE TEMPORARY!!! As soon as you get one thing, you will want somethig else. The only satisfaction you can ever feel exists in the Present. Look for the fulfillment in what is happening now. You have to time travel naked: The Terminator movies are right. Your consciousness is the only thing you can take with you into the past or the future and it’s the only thing you can bring back. No souvenirs. So really what is the point. You come back with ideas and memories that no one will believe and return to a time that is different than the one you left. Plus when you get back, you’ll be totally exposed if anyone happens to be around. You could be late for your own funeral: No matter where or when you are, time will catch up with you eventually. Where will you be when it does? Let’s face it, there is a time and a place for everything. Our time is now. We don’t belong in our past and our futures don’t deserve to be confined to one limited possibility. Let’s make the most of our present so that we can look forward to a future without regret. Finally!!! Thanks for posting again man! How’s everything been goin!? Damn I love this post the best by far. Time travel would ruin the point of life. Which is to live it. With no suprises there would be no point. I recently read the epic beowulf in english class. In the story there is a dragon who knows everything and sees everything. As you can imagine his view of the grand scheme of life is pretty pesimistic. Because the ending for him is spoiled. He says ashes to ashes dust to dust. Meaning that there really is no point to life. It all ends the same way it starts. Which is true. But he has no present. He does not live for tomorow because he knows what it will bring. And that defeats the purpoise of living life. I don’t believe that the person I see in the mirror is reallly me. I am a fraction of the universe. A universe I have no control over. Because I am only a fraction. I do not really matter in the grand scheme of life. There are 6 billion people on the earth and they do not really matter in the grand scheme of the universe. Withought us. The world would still spin. But it is what I have to work with for now haha. Another thing I have for now is the naiveness to live on withought thinking about the end, which is a good thing. I don’t want to know the ending of the movie untill I’ve watched the begining and the middle…Withought the suprise of life and death. There is nothing left. Buddha said “do not dwell on the past, do not dream of the future, concentrate on the present moment” because it is all we have. Pedro if u really have been time travelling u know that the world could end tomorow. This makes the time we have now so much sweeter. Treat every day like a gift. It is why they call it the present.. 🙂 make your next blog on whether or not we exist. Id like to hear your take on this. Because I myself am not sure… oh and I loved rule number 3 the best. This rule is very buddhist in nature. It is very true. We are selfish by nature. I want to let go of myself. Realize what is more important than me. The illution of self keeps a lot of love out of the world pedro. Sadlyy this probably can never be fixed. What do u think of that as well? I love making sense out of all this nonsense. Like you said. I’ll try to remember to write about whether we exist. I know you know what I am going to say from when I was in the future, but now that I’m in the past of that future how I will say it will change though the essence will remain the same. But whatever I say will still be new to you since you know better than to time travel and find out what I am going to say. Besides, if you do then you will not have a reason to ask me in the past of that future which is now and this reply will not be written. So by virtue of the fact that I am sending it, it looks ike things will still be able to play themselves out in a surprising way for all parties influenced by this discourse. Tell the World.